Taylor Gentry (Angela Goethals) is the head of a film crew who that is invited to document the creation and realization of a new slasher icon. That person is Leslie Vernon (Nathan Baesel), and he exists in a world were slasher are real. As the crew films and even helps Leslie prepare to murder a house full of teenagers, they are initially drawn in by his enthusiasm and sense of humor. As they draw closer to the moment where lives are going to be lost, they balk and try to upset his plans. But it’s far too late, Leslie has planned for that as well. 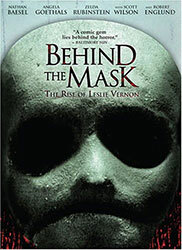 Behind the Mask is a wonderful look at the clichés and iconography of the slasher film. The film doesn’t hold these things up mockingly but instead examines them the appreciation of a fan and attempts to place them in a real world environment. For example: Leslie reveals his seemingly supernatural ability to keep up with victims even though he is walking is entirely due to a regimented cardio routine. There is some really interesting world building going on too. Boogeymen are real; they have social purpose and tradition. They use tricks and misdirection to create the mystique that they are supernatural beings. The movie start out pretty light and funny but gradually the tone grows darker until it drops the mockumentary conceit entirely and becomes a full-on slasher film. Behind the Mask is a love note to the slasher that respects it as an art form while still having fun with it.